I have really enjoyed running Q&A’s on my blog. They are a brilliant idea to get to know the writer behind the book and meet interesting authors. Let me introduce you to Kerensa Jennings, debut author of Seas Of Snow and a woman of many talents! Q) For the readers, could you give us summary of yourself & Seas Of Snow? A) I’ve been writing stories and poems ever since I was a little girl. Although it’s taken me a long time to get around to writing a book, I’m lucky enough to have had a long career in the media as a TV producer, writing television programmes. Most of the time viewers would have had no idea who I was, but my words have informed, educated and entertained millions over the years. I produced, directed, wrote for and worked with some of the most amazing people including Nelson Mandela, Sir David Frost (I was Programme Editor of Breakfast with Frost) and Rory Bremner. I moved away from programme making to strategy and became the BBC’s Head of Strategic Delivery where I designed and delivered strategies for the Corporation, including a significant digital strategy. I now run The Duke of York Inspiring Digital Enterprise Award. I’ve always used literature, and poetry in particular, for solace and escape. I happen to think literature is probably the best self-help on the planet! You can fly into other worlds and find ways through writing to make sense of life. SEAS of SNOW draws together some of my passions and fascinations. While I was at university, I studied the psychoanalysis of fairy tales and got very interested in archetypes and the way characters and stories of good and evil are portrayed. While leading the BBC News coverage of the Soham investigation, I had the opportunity to see first-hand a lot of evidence about the mind and motives of a psychopath. So in SEAS of SNOW, the protagonist Gracie uses poetry and playtime to escape the traumas and abuses of her life; the antagonist, her Uncle Joe, is a very bad man, a psychopath; and there is a subtext of fairy tale underlying the page-turning scenario which hopefully makes you want to read while half covering your eyes. Q) What was the inspiration behind Seas Of Snow? What was the journey from idea through to publication? A) The inspiration was originally sparked by a need for catharsis. I found the experience of learning about what the school caretaker Ian Huntley did to those two beautiful little girls profoundly affecting. I went on to train in psychology and take my learning further after qualifying as a professional Executive Coach. I wanted to explore whether evil is born or made, the question at the heart of SEAS of SNOW. I had the idea of setting the story in the 1950s because of a photograph. In the early nineties, I was living in Paris as part of my studies. I bought a beautiful book called ‘Mémoires d’Enfance’ (Childhood Memories). 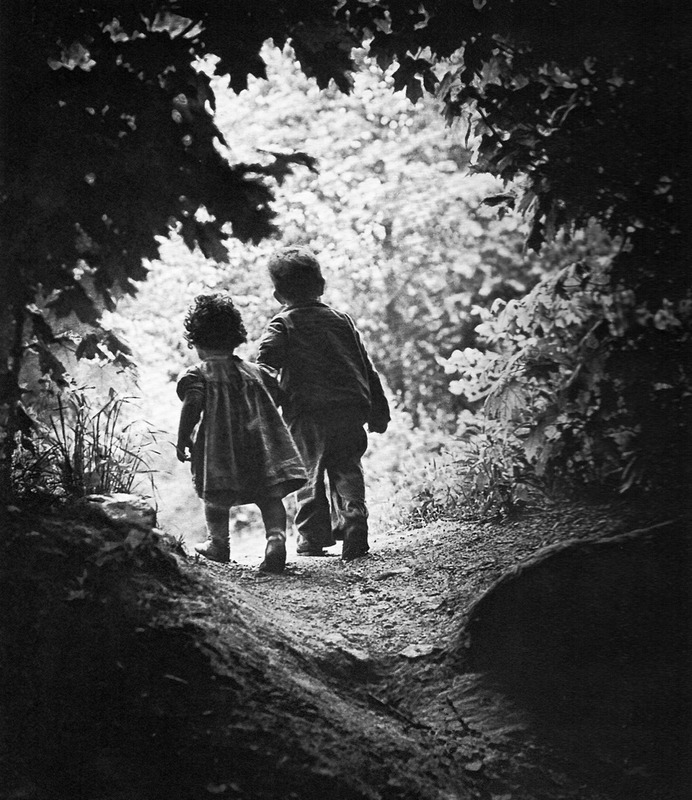 The front cover was a photograph by the American artist W Eugene Smith, and depicted a gorgeous tableau… a little boy and girl, holding hands, chubbily walking into a wooded glade. There is a halo of light around the children, and an air of foreboding in the dark, sinister woods. The photograph is black and white, and you see the children from behind. The little girl is wearing a sweet smock dress, and the boy, slightly taller and older, is clearly taking responsibility for his charge. When I began formulating my story, suddenly this picture re-appeared in my head, and I knew what those children were called. Gracie and Billy suddenly arrived, fully formed as my characters, and from then on there was no choice but to set the story in the 1950s. I wrote the book in all my holidays between 2009 and 2013; then did the final polishing of the submitted manuscript in 2014. Getting published was a fairly long journey. I was fortunate enough that the digital disruptor Unbound fell in love with the book in 2015 and wanted to help me see my vision be published. I honestly cannot thank them enough. Most literary agents want work that can neatly fit into a category, or something with commercial potential. My book does not sit squarely in any category in particular – it’s a thriller in the sense it’s a real page turner; it’s got lots of psychological elements so could be described as a psychological thriller; the story centres around evil and crime – so you could say it’s crime fiction; but then it’s written in an unashamedly literary way – so some people might describe it as literary fiction. What is brilliant about Unbound is that they support authors writing the work they want to write. We ran a crowdfunding campaign in 2015, and I was told that in their five-year history, mine was the second fastest fiction book to reach its target. Click to watch the promo video if you like. Then last year (2016), I worked on the development edit with the amazing Scott Pack who asked intelligent, sensitive questions, and encouraged me to enhance what I had with extra bits of back-story here and there; additional explanations from time to time; and some truly brilliant suggestions that were always given with care and tact. Because his style was to ask questions and explore my thinking, it gave me the chance to analyse whether I had given the reader enough information. In many cases, I decided that I needed to do a bit more. So I did. After the development edit, there was a copy edit which tested detail and robustness of fact, timelines and so on; then the structural edit ensuring everything was in the right place and put together properly; followed by a formatting edit and a few rounds of proof reading. It was completely exhausting! I despatched the final manuscript off in December and the first editions started rolling off the presses in January 2017. Q) The character of Gracie is written exceptionally well and I found she reminded me of my daughter at that young age. She is the true depiction of innocence. What was your inspiration behind her character? A) Thank you! What a lovely compliment. Gracie is, in my mind, the little girl in the photograph. When she arrived in my head, she was a wise, clever little girl. Serious, calm, but imaginative. A child who could take flights into the imagination and be older than her years in her thinking. Some of her attributes come from my own experiences. I kept diaries and wrote poetry from a very young age. I had a funny experience when at one point someone at the publisher who was helping me with the book queried whether a little girl that young would be interested enough to jot down the prices of things and make small notes about things going on in the news. I had to prove that this can, and indeed, does happen, and shared some extracts from my own diary written at roughly the same age! I knew I wanted Gracie to love poetry and to use literature to help make sense of the world. Through her, I am attempting to help people who are not so familiar with reading poetry learn some of the tricks and tips you can use to help make sense of it; and also attempting to share my own love of literature to try to inspire others with passion for both the beauty and the solace it can provide. Her unbridled joy at reading is infectious, I hope, as is her delight in trying to put her own poems together. You are right I wanted her to be the true depiction of innocence. My thesis at Oxford was titled ‘Persecution and Revenge of the Innocents’. I started getting interested in good and evil as themes at school when I studied William Blake’s Songs of Innocence and Experience. So I very deliberately wanted to bring to life a character who would be a truly good person; to act as the most profound counterpoint to the darkness in the soul of the antagonist. Although some of that sounds a bit theoretical, it’s a good old fashioned good versus evil story. A bit David and Goliath. The hardest bit about bringing Gracie to life was ensuring her dialogue matched her age and her character. She is five years old when we first meet her in the book, and as she grows older I needed to ensure her vocabulary developed and her thinking matured. I really enjoyed ‘getting to know’ Gracie as I was writing her. I think we all secretly want a friend like Gracie. Q) I found the novel to be very thought-provoking in subject matter. I stated in my review that it would be perfect for book groups, as the content is ideal for debate/discussion. Also taking the era into consideration, it shows the changes in society. Would you like to see it used in book groups? Are there available Q&A’s for this? A) I would absolutely love SEAS of SNOW to be used in book groups; and yes there are topics, themes and Q+A available for anyone who wants them. Example topics include the nature of maternal love; loyalty; trust; betrayal; abuse; domestic violence; whether evil is born or made; the use of poetry in the book; childhood friendship and psychological motives. This year I am devoting all my annual leave and spare time to work on supporting the book’s publication so I am happy to arrange post-read skype calls, webinars, and personal visits to book clubs if I can make the logistics work. I would also be thrilled to take Q+A from readers and am organising all of these through my Facebook page @KerensaJenningsAuthor and my website: www.seasofsnow.com Please also follow me on Twitter @zinca ! Q) I found the novel deeply moving, with an ending that really packs a punch. What have the responses been so far? A) Thank you so much – that’s so lovely to hear. BooksMonthly said it was ‘absolutely wonderful’, and commented ‘the reveal at the end is nothing short of brilliant.’ Amazon currently (as of 19th March 2017) has 21 reviews, all of which are FIVE STAR! Example quotes include ‘an astonishing book’; ‘phenomenal’; and ‘simply brilliant’. I have to admit I am slightly blown away and cannot stop smiling. I worked hard on the ending because I get so frustrated as a reader when I have invested time, energy and love in a story and it either peters out, has an unsatisfactory or implausible ending, or makes you wish you hadn’t bothered. Example of brilliant endings in my opinion include We Need To Talk About Kevin, The Uninvited, Immortality, Before I Go To Sleep and Gone Girl. I wanted people to read my book and be pleased they did. I also wanted to affect people emotionally, so they could feel a bit what I felt when I was covering the case. I don’t know if it is the wrong thing to say about your own book, but it still makes me cry. Q) What is next, is there a book #2 planned? Will you write within the same genre? A) Yes, SEAS of SNOW is the first of three psychological thrillers inspired by my work in the field as a TV journalist. I am part way through the second one and have planned the third. I also continue to write poetry and do poetry commissions for special occasions. Anyone can get in touch and ask. For anyone who wants to get updates, or contact me, you can sign up to my SEAS of SNOW newsletter at www.seasofsnow.com, write via the website, and of course follow @zinca on Twitter. My Intagram is seasofsnow. *Huge thanks to Kerensa for being part of a Q&A on my blog. I wish you every success with your debut novel and future writing career. Next Next post: My Reviews of Author Qasim Rashid’s Non-fiction books. The Wrong Kind Of Muslim and Talk To Me.